Halloween Ghost Ship Adventure in League of Angels! Trick or Treat! 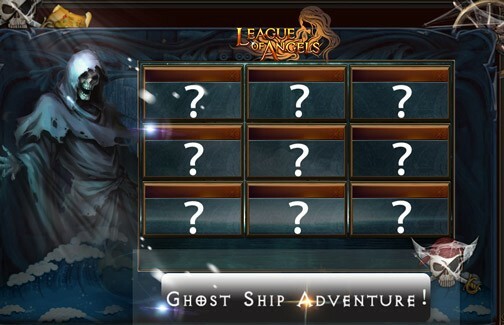 League of Angels invites all players to join a spooky Ghost Ship Adventure this Halloween! Great treasures await those who are brave enough to take on the haunted Ghost Ship! Players have been exploring the great seas in Navigation King, but now there’s a new twist! A mysterious ship, which has been sunk under the sea for hundreds of years, has suddenly reappeared. Filled with treasure, the ship is said to be guarded by the frightening Styx Guardian. Who has the courage to face the Ghost Ship and claim the lost treasures? League of Angels has prepared an exclusive token, Enigma Crystal, for the new Ghost Ship Adventure! Paying any amount of the boarding fee will reward Enigma Crystals, similar to Navigation King! With this token, you can exchange for great items in the Emporium. Whether you want to recruit a new Hero or fight alongside a new Angel, you can use these tokens to make it happen! But keep in mind that these Tokens are only for this special Ghost Ship Adventure and will be invalid after the event ends! You may not swap Pirate Gold for the new token since the former will be back soon. From Oct.27th to Oct. 30th (server time), players will be able to get Angels, Heroes, Mounts and hot resources at the GREATEST DISCOUNT ever! The only rule is, first come, first serve! The crazy sale will start at 4:00:01 PM and last until 11:59:59 PM (all server time) with different items EVERY DAY! In case you didn’t manage to get your beloved items during the crazy sale, they will still be available at discount in Hot Events after the sale ends. But why not take advantage of the insane discounts in this year’s Crazy Halloween Sale? In addition to the exclusive tokens and sales, we have prepared lots of Halloween-themed components. You can create your very own unique Halloween manor! More exciting events are coming from October 27 to October 31 (server time), check them out in the in-game Hot Events menu now! We hope players will have a great time at the League of Angels Halloween Party and look forward to more exciting special events in the future!